Hi everyone. Here is my Design Team card for the latest challenge at Addicted to Stamps & More #42 - Make Your Mark. Any style of card is welcome for this challenge as long as you use markers (any kind) on your creations. Today I made a step card ... something I haven't done for a long time. 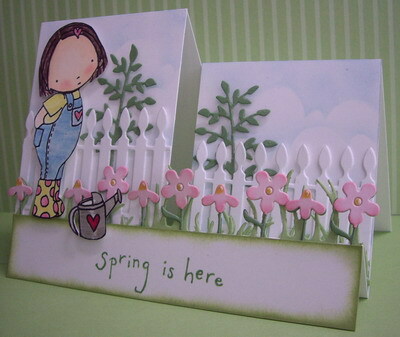 And I added lots of die-cuts to create a spring garden scene. I again used an image from this month's sponsor, Heather Ellis. I love all the Pure Innocence images and had a lot of fun creating cards with them over the past four weeks. I made a step card ... it's a bit hard to capture the essence of the card in photographs, so I am including a few below that will (hopefully) give you an idea of how it looks. Instructions for the step card base are included under the Tutorial tab of this blog. Once I had the base cut, I cut two more panels ... one to fit over the left side and one for the right side. This gave me panels to work on, rather than trying to sponge and glue down elements on the base. Once I had put everything in place, I adhered the panels to the base and it made the card sturdier as well ... a bonus! I sponged the sky using a hand-cut, randomly sized scallop template that I made. I used a very light touch and Bashful Blue ink to create a very soft, cloudy sky. Next I attached a piece of picket fence to each panel, just at the bottom so that the top of the fence is loose ... that made it easy to glue trees behind both (leafy branch dies). I glued a large grass border, followed by the flower border. The flower border is two layers, green for the leaves, with pink card stock for each flower glued on top, with the edges sponged to add more interest and yellow centers colored with my Daffodil Delight Stampin' Write marker. I cut another layer from the bottom card front (1" x 5 1/2"), sponged around the border with Certainly Celery Ink and stamped the sentiment in Wild Wasabi ink. It was adhered to the card front, just covering the bottom edges of the grass and flower borders to hold them in place. Pure Innocence is a digital stamp that I printed onto Whisper White card stock and colored with my markers (along with her watering can). I fussy cut the two images and popped them on top of the card front. A warm welcome to two new members, Lisa S and Susan ... thanks for joining us!! What a beautiful work of art! I love the way you've colored the sweet image! Truly a scene of Spring! This is so very cute. The coloring is beautiful and you did a great job on the sky. I'm ready for some of those Spring flowers. This is such a pretty little step-card, Lolly, which you put a lot of love and work into! So sweetly perfect for springtime!! 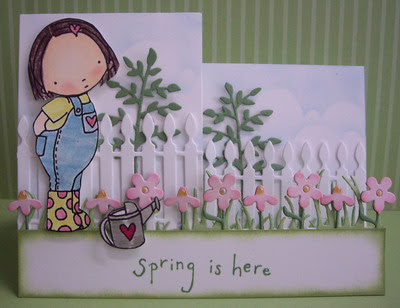 Beautiful card - totally speaks of spring to me! Love the flowers and the picket fence. It's so wonderful having spring here! Totally charming Loll! See the big smile on my face?! Wonderful card! LOVE it! A lovely card Loll and beautifully coloured. Great step card.......I haven't made one for ages either. What a fab card! When I get emails saying there is a new card from you I always look forward to seeing what you've done next. My reaction is always WOW! You are one talented lady. Absolutely brilliant Loll! 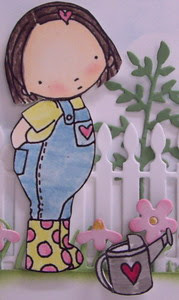 Love the scene you've created with those die cuts:) That picket fence is now on my must have list! Gorgeous card, Loll! That image goes so beautifully with the pretty scene you've created with the diecuts, just lovely. Charming child colored so sweetly. I love step cards. Oh my goodness Loll! Love how you have used the image on your beautiful step card. I have been looking at this picket fence die and wondered how much use I would get from it. I think you have just made my mind up with this TFS. I am looking at this card and laughing! I have a stack of step cards ready and just couldn't come up with my picture....the one in my head! It looks a lot like your card except I wanted some grass with the fence....I think you may have just solved my problem...Hugs!